This sandwich was quite a pleasant surprise! When I order a torta I expect a particular construction and style, the center of which is a large fluffy roll. As you can plainly see in the above photo that is not what I got. This sandwich was served on a thin roll grilled crispy. The carnitas and the guacamole were decent enough but unspectacular and the sour cream was a bit heavy handed but all together this sandwich was a nice change of pace from the standard. I have been accused in the past of holding too fast to the traditional idea of what makes a sandwich and I have always offered in my defense that I do not object to things done differently, only things done poorly. This sandwich is a perfect example, it was not at all what I was expecting but it was quite good. 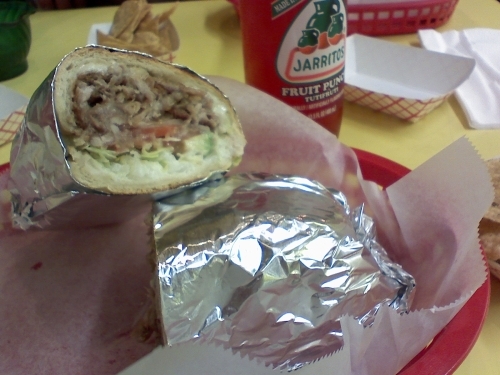 This entry was posted in Sandwich Reviews and tagged Pork, Reviews by Pete, San Francisco, Sandwiches I Have Eaten, Sandwiches Made For Me, Torta by Pete. Bookmark the permalink.